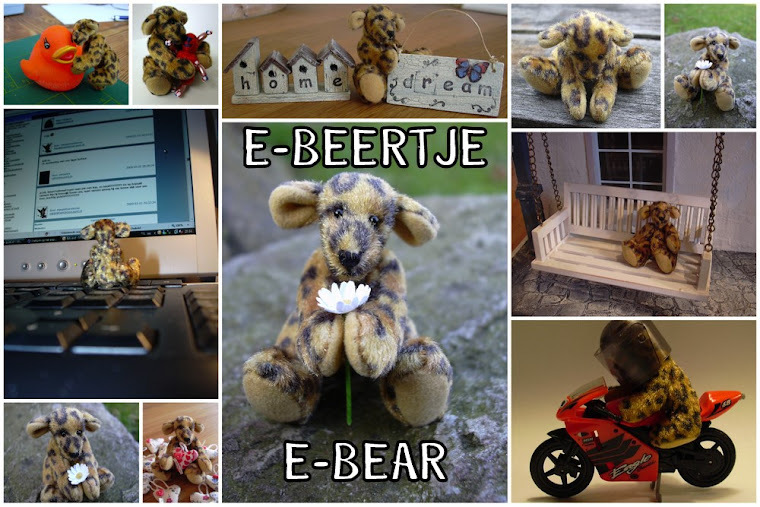 E-beertje / E-bear: E-beertje celebrates his first "Sinterklaasfeest"
E-beertje celebrates his first "Sinterklaasfeest"
Sinterklaas is a traditional Winter holiday figure in the Netherlands, Belgium, Aruba, Suriname and Netherlands Antilles; he is celebrated annually on Saint Nicholas' eve (5 December) or, in Belgium, on the morning of 6 December. The feast celebrates the name day of Saint Nicholas, patron saint of Amsterdam, children and sailors. He is the basis of the mythical holiday figure of Santa Claus in the United States. In the Netherlands, Saint Nicholas' Eve (5 December) is the chief occasion for gift-giving during the Christmas season. The evening is called "sinterklaasavond" or "pakjesavond" ("presents evening"). In the Netherlands, children receive their presents on this evening; whereas in Belgium children put their shoe in front of the fireplace on the evening of 5 December, then go to bed, and find the presents around the shoes on the morning of the 6th. The modern tradition of Sinterklaas as a children's feast was likely confirmed with the illustrated children's book Sint Nicolaas en zijn knecht (Saint Nicholas and His Servant), written in 1850 by the teacher Jan Schenkman (1806–1863). He introduced the images of Sinterklaas' delivering presents by the chimney, riding over the roofs of houses on a gray horse, and arriving from Spain by steamboat, then an exciting modern invention. There was a party in E-beertje's house! This year he celebrated his first "Sinterklaasfeest". With all his friends he put borrowed slippers and boots in front of the fire and they sang lots of Sinterklaas-songs! I was still awake to see Sinterklaas and Zwarte Piet putting the presents in the shoes! Sinterklaas was a little bit startled by the flashlight...I'm sorry Sinterklaas! And what did they get from Zwarte Piet and Sinterklaas? For the sleeping bears there was a whole box of negerzoenen (marshmellows covered with chocolate). For Tink a crystal ball, for E-beertje a very small teddybear, orange bear got a slightly bigger teddybear and Pearl got a beautiful amythist crystal (she loves crystals and all things shiny). And now Pearl is in her freshly painted bathtub, playing with her beautiful crystal, Tink is trying to see the future and orange bear is admiring his teddybear. The sleeping bears have dissapeared...I think they are hiding somewhere with tummy ache...I found an empty box of "negerzoenen"
It's never too early for something good, isn't it? Very pretty pictures of E-beertjes 1st sinterklaasfeest. Hi M-tje,ik wist helemaal niet dat je actief was op je blog??? Ik kwam je toevallig tegen en nu laat ik je niet meer gaan, haha! Het was fijn om je weer even te zien op de beurs, ik zie je in december weer, en dan gaan we een afspraak plannen, en dan kom ik en Syl bij jou op visite,ok!